People influence their environment, often to benefit their own well-being*. This includes such things as food production, central heating and lighting. Animals ‘cultivate’ their environment for similar reasons; ants build huge underground strongholds, beavers create whole river delta’s and elephants keep the savannah clear of trees. Generally, the environment determines the degree to which needs can be met and closely examining the natural environment of the animal or, in this case, the people in question would enable you to define the appropriate (or better) circumstances for proper development and to maintain or improve the level of well-being. This happens increasingly in zoos. And in towns and cities, where more and more people live; some 75% of the population in Europe. People who also spend around 80% of their time indoors. This makes it worthwhile to explore ways of designing the indoor environment in a way that suits our ‘biological organisation’ and stimulates our brain in various ways. 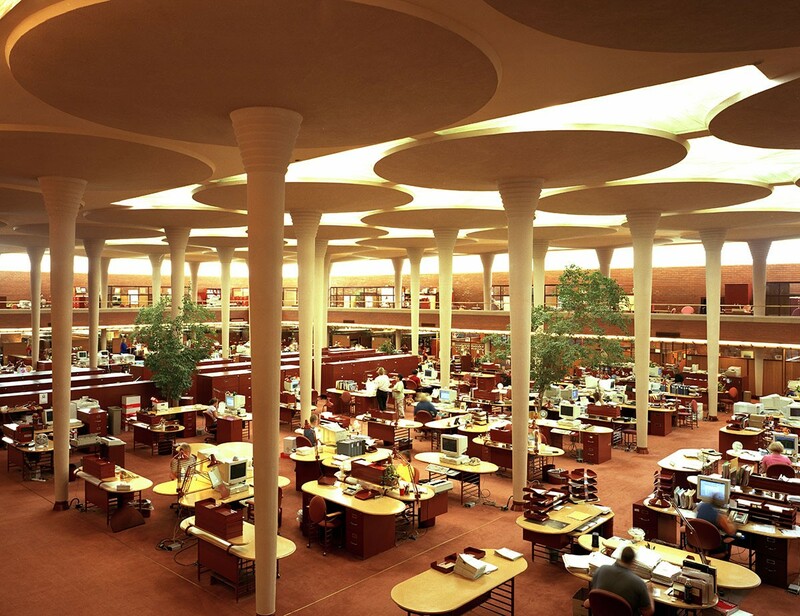 Offices are particularly interesting in this respect; spaces where people spend a lot of time and which influenced them but which they themselves have relatively little influence on. In this context, there is growing interest in and an ever wider range of plants for office landscapes. It appears that people thrive in as natural an environment as possible which, in turn, benefits the organisation. But how does it work? Science has been seeking to answer that question since the eighties, particularly from a psychological angle. This has resulted in various theories explaining the restorative effect of nature: The Biophilia Account, Attention Restoration Theory, and Stress Reduction Theory. These theories focus respectively on an innate need to interact with nature, and psychological aspects that are important to our day-to-day functioning, especially attention and stress. Interesting studies have been performed to measure this and have often revealed that the presence of plants, views of nature or even just images of nature can help reduce stress and/or increase attention levels. The mechanism that causes this effect remains intangible, however. So perhaps we should try to explain it from a different angle. People have a strong preference for visual stimulation. So there must be something about the shape and configuration of plants that the eyes convert to a signal which, once transmitted to the brain, has an effect on attention and stress. If that is the case, you would expect the effect to be the result of an innate brain configuration that develops with the appropriate stimulation. An interesting study recently researched this visual pathway. The theory that describes this mechanism is called Processing Fluency, which states that some shapes and patterns are easier to process than others and that this processing simultaneously affects how you feel (the so-called affective effect of an object). In nature, shapes are often made up of recursive patterns, known in mathematics as fractal patterns. Mathematical fractal patterns can recur infinitely. A fine example of this is the Koch curve, see figure 2. Patterns in this category are called statistical fractals. Koch curve, example of a statistical fractal. Nature applies similar iteration, albeit with a degree of randomness as a result of which iteration does occur but with slight variations each time. These patterns are called exact fractals, natural examples of which include clouds, ferns and coastlines (see figure 3). Applying this mathematical approach to natural patterns makes it possible to identify the properties of an image precisely and to generate new images on the basis of those properties. The properties which determine the degree of iteration (i.e. 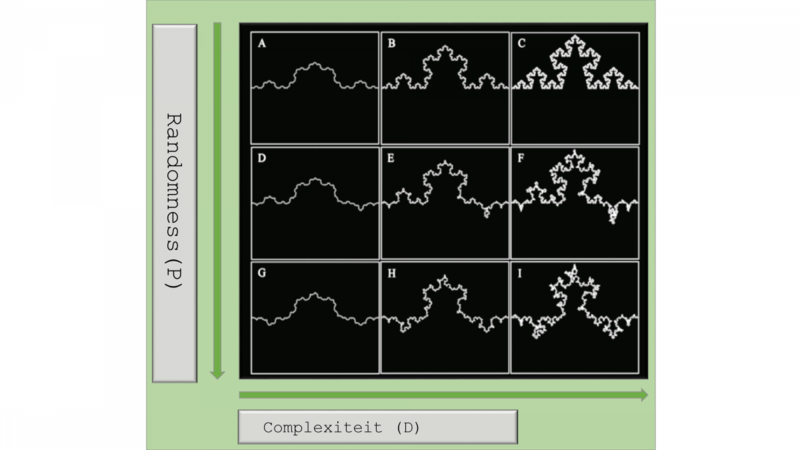 complexity) and the randomness of the fractals are the parameters D and P.
Examples of fractals in nature. Left, a layer of clouds; centre, the mathematical creation of a fern leaf; and right, a mathematically generated coastline. Imagine a blank square. If an unbroken curved line were drawn in that square the D value would be 1, indicating that it contains no fractal structure. The maximum D value is 2, in which case the whole square would be black and also contain no fractal structure. Between values 1 and 2, the line may curve repeatedly, as it were. The repetitive pattern of a fractal line will cause the line to take up more and more space. The higher the D value the finer the line structure. Figure 4 shows how, from left to right, more and more curves occur in the line and the D value increases. 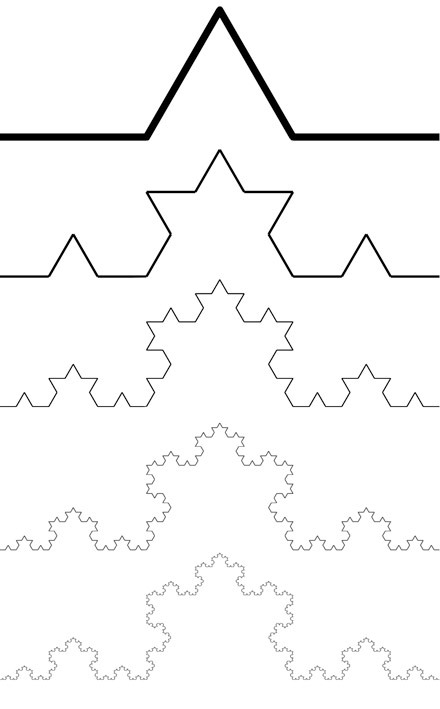 Example of how a fractal pattern changes in terms of naturalness and complexity with the changing P and D values. The P value determines the percentage of curves pointing ‘down’, thus generating a more random, ‘natural’ shape. Figure 4 shows several Koch curves with varying levels of complexity. As could be seen before, the pattern repeats itself by adding a triangle at set points. The P value determines the percentage of these triangles that point downwards, which ultimately result in the curves looking more like a natural coastline, while a P value of 0 generates a more Oriental pattern. This approach makes it possible to create images varying in complexity and naturalness. It can be applied in research to display different variations of such images on a screen and subsequently perform measurements relating to preferences, mental effort, attention and stress, for example. Without going into the exact methodology, eye-tracking, electroencephalography (EEG), and skin-conductance can be performed to examine how our eyes view a particular image (eye-tracking), the corresponding changes in brain activity (EEG), and any effects on the stress level in our body (skin-conductance). Interesting findings have emerged from these studies, such as the fact that people prefer images with a D value of approx. 1.4. The D values of natural patterns are roughly between 1.1 and 1.9, and those most familiar to us, such as clouds, trees and mountain ridges, are between 1.3 and 1.5. This implies that our visual system is adjusted to the shapes we see most often, in nature anyway. It also emerges that looking at images with this preferred complexity can reduce stress levels if stressful mental tasks are performed while looking at them. That is to say: researching the relationship between visual processing and the physiological effect of that process could help us in our search to define the restorative effect of nature. And in discovering effective uses, in offices for example. The idea that our visual system has become specialised in processing natural patterns sounds plausible. Manipulating fractal patterns makes it is possible to link physiological and psychological measurements. This could enable us to explain the restorative effect of plants, for example, less speculatively than the current psychological theories. If our visual system can easily process fractal patterns, such as plants, then that indicates that we can easily distinguish between fractal patterns of varying complexity. That is what enables you to spot a predator or prey among foliage or undergrowth, by its recognisable patterns, such as a tiger’s stripes. Being able to quickly distinguish between the ferns and figs and a tiger, could prove invaluable. To return from this imaginary jungle to the office landscape: if visual stimulation in the form of plants does indeed make processing easier, then staff would have more ‘inner space’ and be better able to concentrate on other tasks. Even stress reduction can be linked to visual processing of nature. It makes working all the more pleasant. Indoor plants can enhance our brain activity. That is good news for companies looking for effective ways of improving staff well-being and productivity. Gazing out of the window while you’re working might not be such a bad idea after all, provided you take in the fractal patterns that is.